A Leopard is one of the hardest large species to observe in Uganda, thanks to it’s nocturnal, solitary behavior and well camouflaged coat. Their survival is partly due to their adaptability to warm and cold climates and ability to climb trees while carrying heavy prey keeping it safe from other predators such as Lions and Hyenas. Leopards are too shay animals that are rarely seen in open areas therefore this makes them most rare animals to spot out, Leopards in Murchison Falls National Park. They can run at an incredible speeds of up to 58 km(36 miles) per hour, they commonly feed on Antelopes, Monkeys, Fish, Birds, Insects and Reptiles. Historically, Leopards were hunted because of their beautiful spotted skin as it was commonly used by most local leaders as a symbol of them being great warriors. This caused their decrease in number hence being scare to meet across the continent but these can be spotted out from some of Ugandan National Parks on a lucky day. Leopard spotted out in Queen Elizabeth National Park. 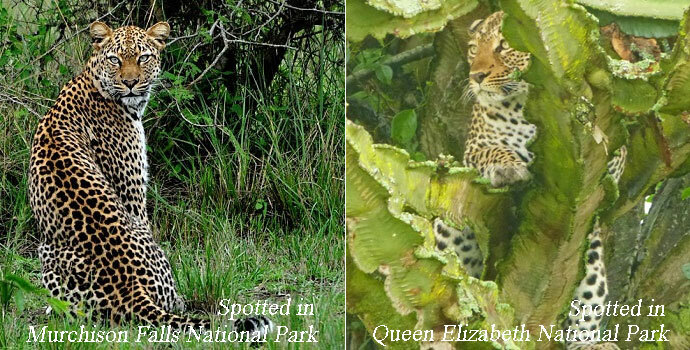 In Uganda we can encounter Leopards from three different parks that include Lake Mburo National Park, Murchison Falls National Park and Queen Elizabeth National Park. Visit our website: www.kjongsafarisuganda.com for detailed information about Uganda and it’s most treasured wonders hence Book a trip to Uganda the Pearl of Africa and build a life time experience with rare primates like Gorillas.